This article is an excerpt from the award-winning book, The Evolution of an Entrepreneur. Since the beginning of my career, I have been creating and refining what I call the “Nadel Method,” outlining five steps aimed at providing a clear process for business success. 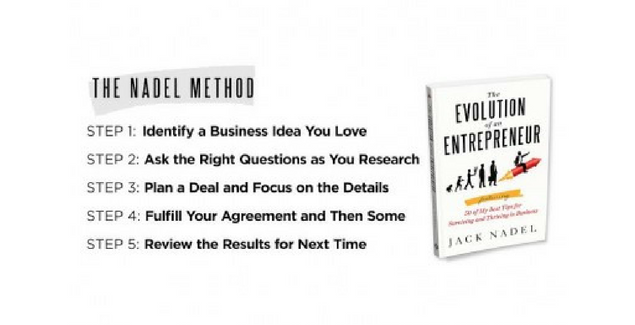 After nearly 70 years of business experience, I am confident that entrepreneurs from all backgrounds, industries and levels of business knowledge can utilize The Nadel Method, outlined below, and included as a section in my latest book, The Evolution of an Entrepreneur, featuring 50 of my best tips for surviving and thriving in business. A few years back, I was teaching a business course at the University of California, Santa Barbara. One of the first questions I was asked was, “What is the right business today for me to be in?” My answer to this question is always, “What is it that you really love to do?” This is the first question you must answer; then you find a way to turn what you love to do into a business. When you make this choice about your career, however, you must clearly understand your strengths and weaknesses. There is a difference between a wish and a goal. A wish might be to play point guard for the Lakers. An achievable goal might be to work with an NBA team in their marketing or sales department or to become a supplier to an NBA venue or retail outlet. OK, you have pinpointed a new business. Understand that if it is a good idea, the odds are that someone has thought of it before you. This fact should not necessarily discourage you, but it is imperative that you research what they did, how they did it, and how you can do it better. Before you spend a dollar or many hours of your time, you must use logical thinking to get answers to some very precise questions. First, is your business idea a product or a service? If it is a product, what other products in the marketplace are the same or similar? If it is a service, who else is performing this service, and is it being done successfully? How big is the market? How fortunate we are that much of what we want to know is accessible right on our computers or even on our mobile devices. I remember one budding entrepreneur who came to me for advice on how to make his newly created business really work. I asked him if anybody was already putting his idea to use or attempting to develop it. He replied, “Absolutely no one has done it … isn’t that amazing?” I immediately went to my computer; a number of different companies were doing everything he had talked about. Yet this person had spent a great deal of money on proposals and trying to raise capital. This is one of the first things you have to know. It is not easy to raise capital on an idea that you have not investigated thoroughly. Thousands of people come up with millions of ideas. But they have nothing until they have proven that an idea can work. Now that the stage has been set mentally, you must be determined to start making good things happen. Every vocation requires a distinct mindset. A philosopher thinks in abstractions, while an engineer imagines the way things work. A comedian searches for humor in every situation, while an entrepreneur thinks in specifics with laser-like precision. Business details can be tiny, in the form of millimeters, pennies or subtle shades of color. As an entrepreneur, you have to know that stress is guaranteed. You must have a genuine passion for success in order to manage the frustrations of the journey. Jack Nadel is a decorated veteran of World War II. He is an international hall of fame entrepreneur and award-winning author who has founded, acquired and operated a dozen successful companies. 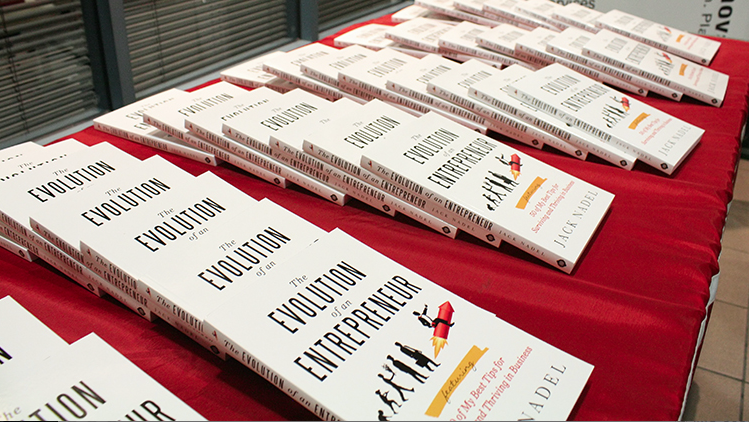 You can find him on twitter @JackNadel and read his latest book, The Evolution of an Entrepreneur. After you finish The Evolution of an Entrepreneur, here are a list of books to read before you even think of starting a veteran-owned business. Also, check out Steve Blank’s Udacity course here. It is self-paced and takes less than a month. He is an Air Force veteran and legend in the startup world. P.S. Check out our 15 Hot Franchises for Veterans: 2016 Edition if you want to go the franchise route. I am honored to have my 5 step startup method included in your materials for veterans interested in entrepreneurship. Vetrepreneurship is a path that can lead to true financial independence and continues to serve our great country through the economic impact entrepreneurs have in their communities and beyond. I commend those who take steps to explore becoming an entrepreneur.